Angel Karen Ralls' inspirational novel will make readers believe in the possibility of heaven on earth. 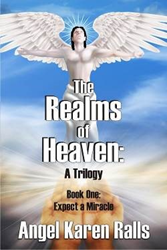 "Expect a Miracle" is the first of three books in "The Realms of Heaven" series. It’s a story of love and courage: the courage to believe in dreams so they can become reality. Meet Angel Rose, a child of earth, who communicates with Haniel, the granter of wishes from seventh heaven. He tells Angel Rose that after several lifetimes he can finally communicate with Earth’s children as a messenger for mankind. And all it took was the Internet! Haniel wants to make Earth into a heaven world, where there’s no fear or war. Instead there’s peace and love between all the planet’s people. He takes Angel Rose to seventh heaven, where she meets angels, archangels, and other special children from Earth who are also working as peacemakers. Will they succeed? This inspirational novel is about the possibility for heaven on earth, because those who believe in miracles will see them happen. Expect a Miracle! About the Author: Angel Karen Ralls was born in Stockport, England. A hypnotherapist and psychotherapist, she has three grown sons. As a child, she always loved magical stories of how good ultimately triumphed over evil. She respects all religions and believes in the power of the mind for positive change. “Miracles can and do happen in this inspiring fantasy adventure. It’s all about saving the planet by ending disputes and war for all time. We’re thrilled to be the publisher of this unforgettable novel,” said Robert Fletcher, CEO of Strategic Book Publishing and Rights Agency. Amazon.com, Barnesandnoble.com and in multi-formats for other e-Readers through numerous vendors online. The soft cover version (ISBN: 978-1-62516-541-1, $11.50) can also be ordered through the publisher’s website: http://sbprabooks.com/AngelKarenRalls or at Amazon.com or Barnesandnoble.com.